It is shocking, and even more so when viewed from afar, to see the pressure that the political oligarchy of Catalonia has been able to exert on the Spanish State, but what is really extraordinary is the popular support it generated, in part due to its own efforts, but also because of the simultaneous convergence of a certain number of factors that are favorable for the so-called “procès”. The Catalonian question is part and parcel of the crisis of the State. No one can be unaware of the fact that political Catalanism participated in the drafting of the post-Franco Spanish constitution and that it played a stabilizing role during the “transition” from the dictatorship to the system of amnesiac parties, facilitating on various occasions the “governability” of the State from which it now wants to separate. In exchange for these services, it obtained certain rewards. A web of political-economic interests crystallized around the Generalitat, the municipalities, the county governments and the other institutions of the autonomous region of Catalonia, responsive to the most powerful financial and commercial interests. The capitalist dynamism of Catalonia demands a considerable increase of local decision-making powers that is inconsistent with the centralist tendencies of the old monarchist State. Its supporters hoped for a redistribution of power in the form of a new “Estatut” of autonomy, affecting the control over the region’s infrastructure, and above all over its judicial and fiscal affairs. However, the decision announced by the Supreme Court in 2010, which in practice rescinded the promised Catalonian Magna Carta, dashed these hopes and was the signal for a radical change in the strategy of the Catalonian bourgeois oligarchy, which could not even deal with the debts incurred by the executive branch of the Generalitat. Having set itself the short-term goal of independence, it gained the support of all those sectors that could consider themselves harmed by the economic crisis, by the corrupt and authoritarian central government, by Spain’s reactionary right wing, by the Bourbon monarchy and by capitalist globalization: owners of small businesses and shopkeepers, the wage earning middle classes, government employees and members of the regional police forces, trade unionists, students, mayors, municipal councilmen and residents of small cities and agricultural towns, irredentist separatists, etc. There was a resurgence of a “Catalonian people”, prepared to obey the directives of its leaders transmitted to them by an effective apparatus of mobilization (the ANC, Omnium, TV3), always behaving peacefully and civilly, in accordance with previously established guidelines that were broadcast in detail. By emphasizing the disdain of the Catalonian patriots for nationwide fronts, for general assemblies, for the kale borroka [Basque insurgency] and for wildcat strikes, nationalist propaganda succeeded in creating a world apart, peaceful, with its own symbolism, its heroic figures, its convivial image and its shared spaces, with a discourse, a people, victims and enemies made to measure. Appearing before an imposing demonstration of popular acquiescence, like those convoked by the executive branch of the Generalitat, the pro-sovereignty parliamentarians could present themselves as scrupulously compliant with the mandate granted to them by a well-trained population, which, far from meeting in assemblies to debate and constitute itself as such, put all its faith in its political leaders and its media directors. The concept of a “people” is inherent in the concept of sovereignty, since the sovereign people is the source of a new legality, more “democratic” than state sovereignty. Therefore, the people engaged in struggle against Spanish colonialism have the “right to decide”, that is, the right of self-determination, to secede from an oppressive state and to have their own government, preferentially a republic. As authentic “democrats”, interpreters of the popular will, the pro-sovereignty deputies voted for the new legal course of self-determination in order to subsequently participate in good-faith negotiations with the Spanish State, which, as was to be expected, was not willing to join such deliberations. 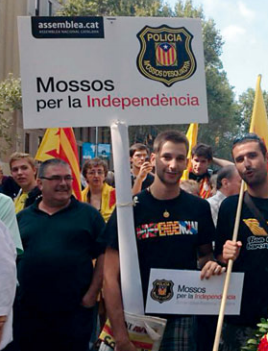 This was the weak point of the pro-sovereignty strategy, which transformed the spectacle of separatism into a comedy. The end of the “procès” was not as heroic as the day of the referendum. After the big demonstrations against the repression, in which numerous Spanish loyalists also participated, and after the climax of the symbolic declaration of independence in the Catalonian Parlament, a simple government decree was sufficient to return everything to normal. It was not independence that was on the agenda, but “dialogue”. The heroic “people” stayed home watching television, while the interim managers appointed by the ministries of the central government occupied the local councils without the need for the intervention of a single agent of the public forces. The transfer of the headquarters of La Caixa and the Banc de Sabadell signaled a headlong flight of businesses that clearly revealed, along with a controlled fall in stock prices and a decline in tourism, the defection of the capitalist executives from the “procès”. This was the second mistake of the pro-sovereignty movement, i.e., the idea that they could be sure of capitalist support despite an initial slump in profits. The third mistake was the internationalization of the Catalonian cause. The pro-sovereignty forces played their last card quite well, that of seeking international “mediation”, but the diplomatic battle ended with the victory of the central government, since no State supported the “procès”. As in the game of snakes and ladders, the pro-sovereignty bloc landed back on square one, once again resorting to the obligatory victim narrative and internecine battles over the movement’s leadership, utilizing, as usual, Catalonian culture and frivolously accepting new elections for the autonomous region with the aggravating circumstance of having provoked the rise of a powerful Spanish loyalist movement. Did they really need to go to so much trouble for such meager results? It is obvious that the Catalonian crisis was serious enough for the State to arrange for a different status for Catalonia under its jurisdiction, with greater autonomy, but it will not be the current pro-sovereignty elements who will negotiate this transformation. The enemy—the loyalist bloc—has emerged morally and electorally reinforced from this conflict. The urban working class masses, depoliticized by decades of social democracy and Stalinism, have become “constitutionalist” without knowing anything about the Constitution. In the working class neighborhoods of the Barcelona metropolitan region, in the big cities, and all along the Mediterranean coast, Spanish flags are flying. As was so often the case in the past, the degree of sovereignty will be determined by the parties that are not in favor of sovereignty. It is an irony of history. It is also obvious that Catalonia will be ungovernable if any attempt is made to rule it without any concessions to the pro-sovereignty movement. The latter’s many contradictions will not detract from its electoral support. If things have not turned out as planned—and while it is clear to those who have not been convinced by the official account of the meaning of the sovereignty movement that the “procès” was, more than anything else, a very cleverly staged farce—what might nonetheless seem strange but really is not at all odd is the fact that for most of its supporters none of this makes any difference. The pro-sovereignty movement was an excellent manipulator of emotions. Its followers wanted to hear exactly what their leaders told them, without worrying too much about the falsehoods or the demagogy that the messages thus conveyed might contain. And this is still the case. Deception and truth are not distinguishable in a sentimental and hypnotic context, because nationalism is a faith and its goal lies in heaven above. What the masses wanted was catharsis and that is just what they got. The emotional discharge made possible by the enormous stage sets filled with crowds of extras was accomplished realistically enough, and in the end other, lesser discharges would take place in the upcoming ceremonies of a pure independence for which no one has to be sacrificed. This is what counts, not the truth. The most disturbing aspect of the whole business is the fact that dissident minorities took the bait and confused what was a dispute between two factions of the ruling caste with a struggle for popular liberation. A vulgar redistribution of power was mistaken for a social conflict! Without the least hesitation they enlisted in an electoral mobilization that, even in the most generous interpretation, had no other intention than to constitute a State similar to the existing one, only on a smaller scale. A Little Spain [Españita], as the late Agustín García Calvo said. People who not so long ago were persecuted by the Mossos and insulted in the Catalonian Parlament were suddenly applauding the Catalonian forces of repression and were willing to risk their lives in defense of the voting stations set up by the executive branch of the Generalitat [the Govern], eager to participate in an inter-classist movement without questioning in the least its leadership and its goals. It is not easy to explain how nationalist clichés penetrated them so thoroughly, or what brought on such a pathological intellectual collapse on a mass scale, or how such widespread frustration could take such an irrational and trite political form. We are witnessing the funeral of an era, that of reason, that of the conscious proletariat, that of the class struggle, and passions have been placed at the service of unreason. It is true that it has been some time since the autonomous workers movement disappeared, leaving in its wake the wreckage of a sense of class uprootedness and defeat. And it is even more true that social exclusion has not generated an anti-capitalist movement, not even at the most elementary level. The determinant factor in our current situation, however, is the politicization of the wage-earning middle classes, which were until recently the electoral base of the traditional parties, a phenomenon responsible for an abandonment of social questions in favor of the political struggle. The state- or anti-authoritarian socialism of the proletariat has been overshadowed by the civil society movement of the new middle classes, which are decidedly nationalist in Catalonia, and self-management has been sidelined by the “assault” on institutions. The end of the working class as a transformative social force has left the initiative to other, more socially conservative, Keynesian, profoundly statist classes, and, in the meantime, the rebel minorities, the libertarian ghetto, the alternative trade unions and the so-called social “movements” merely reflect the decline of class consciousness, the loss of memory, and the forgetting of the lessons of the past concerning the experiences of the false struggles of the middle classes and their politics. Anarchism has lost its “bond” with the workers, but it seems to have discovered a solid enough connection with nationalism. The rights of labor have joined forces with the liberty of peoples, and ballots have joined forces with direct action. Anarchism has converged with the Catalonian Left in the Committees for the Defense of the Referendum, first, and then with the Committees for the Defense of the Republic, becoming esoteric and populist, since it defends an illusory “people” and fights on behalf of a phantom State. It is prepared to serve as the cannon fodder for the pro-sovereignty movement, that is, for a fraction of the bourgeoisie. The CNT and the CGT themselves have university professors serving as the general secretaries of their organizations; the crème de la crème of the citizenry direct these organizations that have nothing anarchosyndicalist about them except their names. And the worst thing of all is that libertarian reformism and pro-sovereignty have not given rise to an extreme left that would seek to draw clarifying lines in the anarchist movement. The latter is not capable of such a thing, and is no longer capable of conceiving a social project that is clearly demarcated from the pro-sovereignty and civil society movements. It is not capable of constituting itself as a radical social current distinct from the other substitutes for such a current such as the CUP, Podemos or Los Comunes. The neo-anarchist ideology revolves around the concept of “the people”, an idea borrowed from primitive bourgeois nationalism. “The people”, however, is not a political subject, much less a class distinct from the bourgeoisie, a socially homogeneous and unified majority that fights for liberation and to construct a State that would guarantee its liberty. It is indeed true that there is no revolutionary subject, since there is no workers movement that could perform such a role. But there is no Catalonian people, either; what is called by that name is only the product of the institutional propaganda of the pro-sovereignty movement, a submissive mass of voters related to one another virtually through social networks and apps on their smart phones, rather than the manifestation of an independent will emanating from a collectivity that is conscious of its past, forged with direct relations and real common interests. In the final analysis, the Catalonian people is an entelechy by means of which the pro-sovereignty caste turns itself into a national class and constitutes itself as a nation, for which purpose it only lacks its own State. Patriotism is a statist religion. This is the reality that lies behind the alleged “sovereign people”: a public relations image, an abstraction that leads to other abstractions like “fatherland”, “nation”, “democracy” or “State”. A myth that allows a few clever social climbers to speak in its name and to claim its institutions as their own patrimony, for their own personal advancement. In a world of full-blown globalized capitalism, there are only exploiters and exploited, whether or not they are Catalonians, there are only a ruling class and the ruled classes; there are only leaders and led, oppressed masses and the State, and there is room only for nationalist false consciousness or revolutionary class consciousness, for narrow-minded patriotism or the universal ideals of emancipation. There is nothing to be expected from the fatherland but abstract liberties, ruled over by a privileged caste; real liberties will be the product of a class struggle prosecuted to its ultimate consequences. From today’s real antagonisms, a new proletariat must arise that is inaccessible to ideological fashions, to the alien projects of other classes, to palace coups, to nationalist illusions. Despite some unexpected results, such as, for example, the decline in tourism, the real estate crash, and capital flight, for which we are sincerely grateful, social struggles must follow their own paths and display their difference. There are conflicts in which one must participate and others in which one must not. It is not about a war between flags, or a competition among the secondary manifestations of political phenomena. Nor is it a matter of putting together a populist salad with all the ingredients. It is a specific way of acting and a struggle to the death for ideas, typical of a revolutionary collectivity that is trying to take shape. Very good and worth another read. Maybe worth pointing out to other libcom readers that this useful 'Homage to Catalonia' text also has some critical discussion at the tail end which includes some compare and contrast with the views expressed by Miguel Amoros worth a read if you can cope with the tiny print.